There are a number of groups involved in GPTC that would like to regularly document and expose outrageous tobacco marketing and promotions in their country -- but lack access to cameras. Just got a new camera, and have your old one lying around? If you have a good quality used camera (35 mm) that you would be willing to donate to a tobacco control group overseas, please contact us. We will make sure that all donated cameras go to groups that will put them to good use! Please forward this appeal to your colleagues, listservs, and anyone else who might be able to help out. 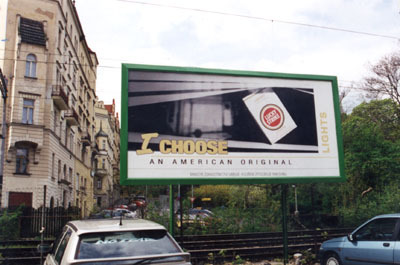 There are many tobacco control advocates abroad, particularly in Africa, who could benefit tremendously from used computers. Laptops are much easier to ship overseas than are larger computers -- from both a financial and a logistical perspective. Unfortunately, there are far fewer used laptops available for donation than there are larger computers. If you have a laptop that works fine and that you would be willing to part with, please contact Essential Action! There are a number francophone African groups that have been waiting patiently for appropriate U.S. partners. As none of the groups are proficient in English, we need to identify partners that are at least minimally proficient in French. If you know of anyone working in the field of tobacco control who has some French skills and might enjoy collaborating with a tobacco control group in Africa, please let us know! Complete French fluency is not required. Many individuals who feel "rusty" using a second language, have found on-line translators useful aids. Please forward this request to your listserves, and send us the names/contact info of any people you know who might be interested. 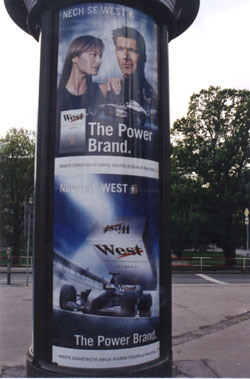 Here are some photos that Amy Rand of Reality Check - Tompkins County (USA - NY) took in the Czech Republic and Germany in 2002. 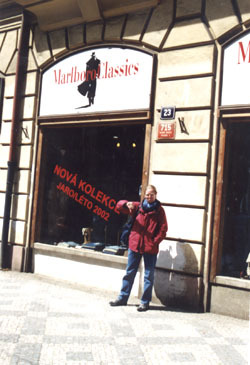 We encourage other GPTC groups to document tobacco marketing and promotions while traveling abroad! 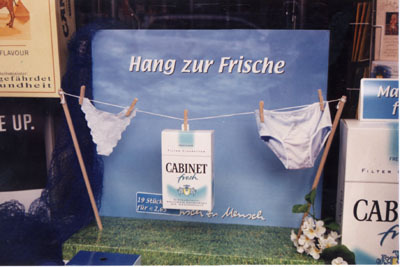 Germany: When all else fails, try selling cigarettes with the slogan, "As fresh as your underware"